The West Virginia University football team wasn’t the only big winner this weekend. 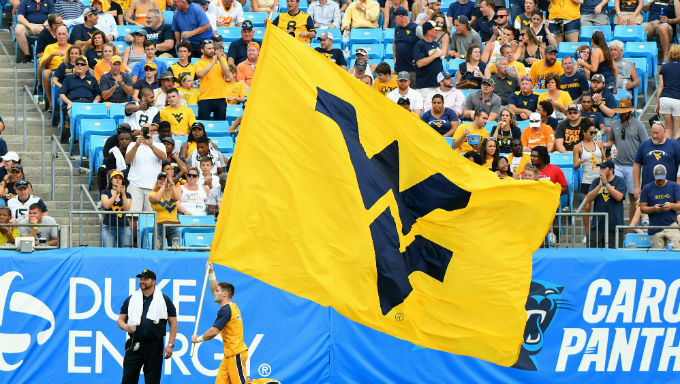 West Virginia became the fifth state in the nation to take a legal sports bet this weekend. Hollywood Casino at Charles Town Races took the first wager, placed by former Washington Redskins and Notre Dame quarterback Joe Theismann. After months of regulatory delays, West Virginia becomes the latest state to take a legal bet, providing another milestone in the growing U.S. market. It wasn’t always smooth sailing for sports betting in the Mountain State. A sports betting bill breezed through both the state House of Representatives and Senate which would legalize sports betting even before the Supreme Court struck down the federal ban. Gov. Jim Justice didn’t sign the bill, but he allowed it to pass it into law by refusing to veto it. When the court announced it struck down the federal ban in May, West Virginia in theory could have taken a bet that same day. In practice, that process was far more arduous. As with all states with legal sports betting, gambling purveyors are subject to conditions from a state-run regulatory body, which is the lottery commission in West Virginia. Unlike some other states, regulatory bodies here dragged their feet through the process. This was further exasperated by the governor’s office. Professional sports leagues lobbied Justice heavily to include what they called an “integrity fee” in any legislation, arguing they needed a cut of the state’s sports betting profits in order to assure the sanctity of the games. State lawmakers were vehemently opposed, saying the fees weren’t needed to prevent corruption and that they would hurt the state’s bottom line. Justice was in a unique position. His family owns the Greenbriar resort, which houses one of the state’s five gaming facilities. It also hosts an annual PGA Tour event as well as an NFL training camp. Though the governor’s office never followed through with a veto over integrity fees, the governor’s inaction to advance sports betting legislation led some to worry he may prevent sport betting from coming to fruition without the fees. These fears subsided in August when state officials filed final regulations with the Secretary of State’s office, just ahead of a deadline that could have delayed implementation for months. With the final regulatory procedure cleared, casinos could apply for inspection to receive sports wagering approval. Hollywood Casino was the first to do so, ushering in a new era in West Virginia gaming. It took its first bet hours ahead of the Mountaineer’s season-opening win and a few days before the 2018 NFL season. Football is traditionally the most lucrative time of the year for sports betting operators. Expect quick action from the state’s other casinos (including the Greenbriar) as they finalize applications take bets sooner than later – and other states to increase their efforts for the 2019 pro and college football seasons. West Virginia sports betting will have an impact beyond just its borders. Charles Town is in the state’s eastern panhandle, convenient to Maryland, Pennsylvania, Virginia and Washington D.C. It becomes the closest casino to place a sports bet in the entire Washington D.C. metropolitan area of several million people. Residents of these states are expected to wager millions of dollars in the coming months, which may spur their home states to re-evaluate sports betting of their own. Maryland considered a sports betting bill in its most recent legislative session, but it couldn’t pass through both chambers of the statehouse. With West Virginia sports betting, the Old Line State now has its western and eastern border taking bets, as Delaware took its first bet in June of this year. Ohio and Kentucky, two more West Virginia neighbors, have already introduced legislation ahead of their respective 2019 legislative sessions. Both are hopeful they can legalize sports betting within the next year. That in turn could spark further developments across the Midwest and sports betting expansion throughout the U.S.